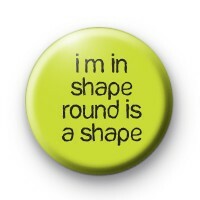 I'm In Shape, Round Is A Shape button badge. Proud of your curves this fun green and black 1-inch badges lets the world know you are proud of your shape. No dieting or body shaming aloud! All our badges are handmade in Cornwall.